So as of late, I've been watching a few movies. I was really excited for this movie since the preview. I have to admit, I was a bit skeptical about Kristen Stewart since she seems to only have one set character she plays. I feel that some scenes could have been more emotional, but overall she was good. The real star of the show was Charlize Theron. She was amazing as the Queen. The Queen's backstory is also included and it was so much more than just vanity and self-centered-ness. In order to save her, her mother put a spell on her and told her that her beauty would save her. However a steep cost of consuming the youth of young women. In order to save herself from this curse she would have to have the heart of 'The Fairest One' - Snow White. 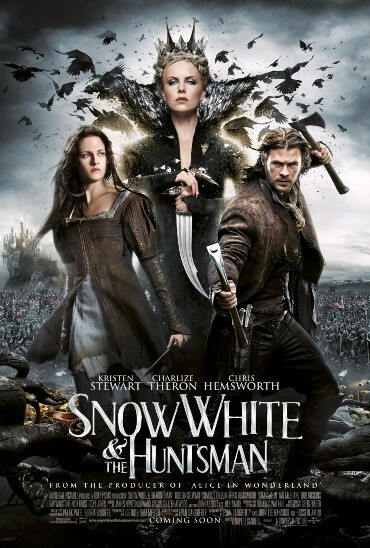 Chris Hemsworth also did a wonderful job as the Huntsman. He's a widower who when his wife died, sought comfort in drink. Snow White escapes from her prison and ends up in the Dark Woods. Since the Queen cannot go into the woods since she has no powers there, she commissions the Huntsman to find her and bring her back. I think the best part of it all was the fact that the story was not as focused on Snow and how (irritatingly) perfect she is or the whole Prince Charming coming to rescue her. It's about rebellion and the fight to be free. 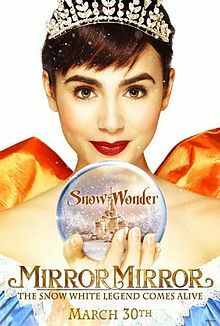 This rendition of Snow White is a lot closer to the fairytale than Mirror Mirror which was slightly more whimsical and non-sensical. It's slightly darker and I enjoyed it a lot more. Another Snow White rendition! Starring Lily Collins and Julia Roberts. This version of Snow White is quite quirky and a little non-sensical. The Queen in this version is shallow and materialistic. Due to the fact that she spends so much on her appearance, she taxes the population dry and is now required to marry someone wealthy. A Prince from another kingdom pays a visit and she is determined to marry him in order to get to his wealth. Snow White sneaks out of the castle to see the kingdom which is rightfully hers and is appalled to find that everything is drab and no one is ever happy. Although in this scene, I can't imagine the Queen's right hand man could be so blind as to see past Snow in her bright yellow cape and her enormous dress. When the Queen asks her right hand man to kill her, he lets her go. The dwarves find her and let her stay with them. They train her to be like them - thieves. However, they agree to steal from the Queen and give whatever they steal back to the people of the Kingdom. To be perfectly honest I didn't really enjoy this as much. It was pretty shallow and not very thought provoking. I guess it's one of those light, silly movies. Featuring Richard Gere, this one's a touching movie about a dog's loyalty to its owner. 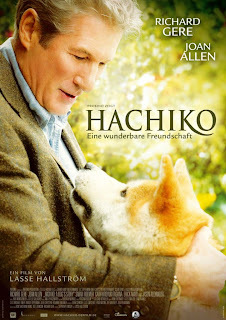 It's based off the story of the real Hachiko who waited for his owner to come home every day at the train station even after his death. I could not stop crying throughout the movie. Richard Gere, as always, gives an outstanding performance. Definitely a must watch movie! Agree! Mirror mirror kind of had a alice in wonderland kind of feel for me! but still very enjoyable!